Heat oil in skillet over medium heat. Add onions and kale, cook 10 minutes until starting to brown. Stir in garlic, spices, tomatoes, chickpeas, and water. Simmer 10-15 minutes. Meanwhile, prepare couscous according to package directions. 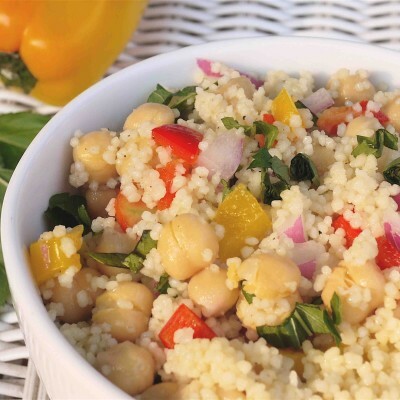 Top chickpea mixture over 1⁄2 cup couscous and enjoy! Throw chickpeas on a salad for a good protein source. Blend chickpeas with lemon juice and spices to make homemade hummus. Roasted chickpeas make a filling, nutritious snack. Substitute chickpeas for ground meat in Italian pasta dishes.